Scientists have discovered that tiger sharks are aiding in the regrowth of seagrass beds by scaring off grazers such as dugongs. When factors such as heat waves destroy seagrasses, sharks become critical for ecosystem health. 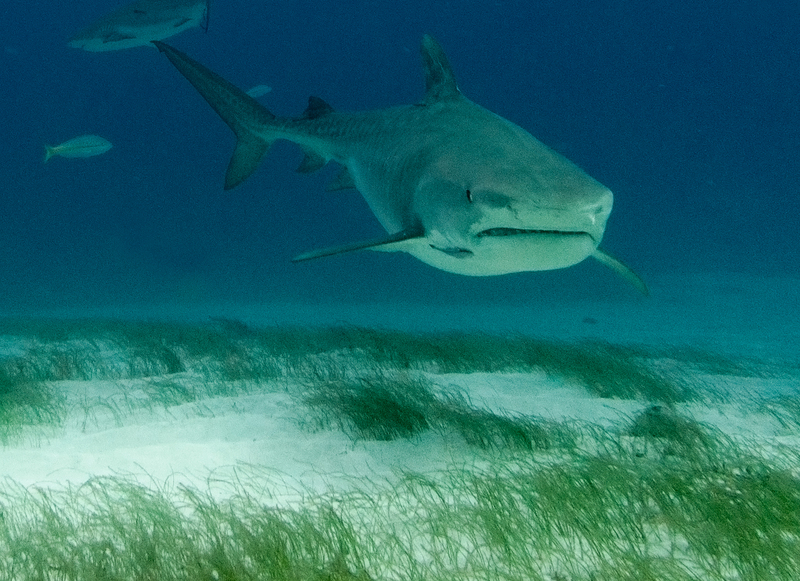 Where tiger sharks rove seagrass beds, dugongs and other shark prey steer clear. That keeps seagrasses—which these grazing prey like to eat—from being completely eaten away. Seagrass is essential to the fishing industry. Found in salty and brackish waters worldwide (except Antarctica), seagrass generally grow at depths of one to three meters where there is sufficient light. They provide shelter for marine animals. By providing a three-dimensional structure in an otherwise barren sea, seagrasses provide the perfect hiding place for fish and invertebrates such as crabs, shrimp and clams. “In developing countries, this is of major significance for food supply and livelihoods, where everything can be caught, eaten or sold. In developed countries, seagrass fisheries are exploited more for recreational purposes or are highly species specific—for example, clams,” said Dr Leanne Cullen-Unsworth, from Cardiff University’s Sustainable Places Research Institute. Seagrass beds also store vast amounts of carbon—known as blue carbon—and help to offset greenhouse gas emissions and climate change. Although seagrass meadows occupy less than 0.2 percent of the world’s oceans, they are responsible for more than 10 percent of all carbon buried annually in the sea. Per unit area, seagrass meadows can store up to twice as much carbon as the world’s temperate and tropical forests. Coastal seagrass beds hold up to 83,000 metric tons of carbon per square kilometer, mostly in the soils. beneath them.